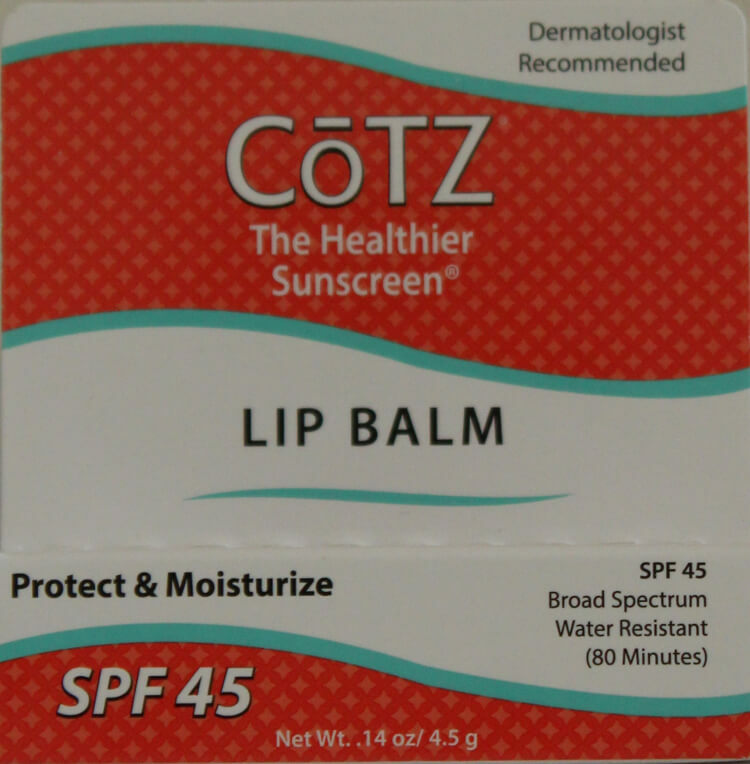 This is a hands-on review of CoTZ Lip Balm SPF 45. In this review, I’m going to provide you with everything you need to know before buying the product. I’ve included relevant photos of the product’s packaging and the lip balm in use both on my skin and lips. 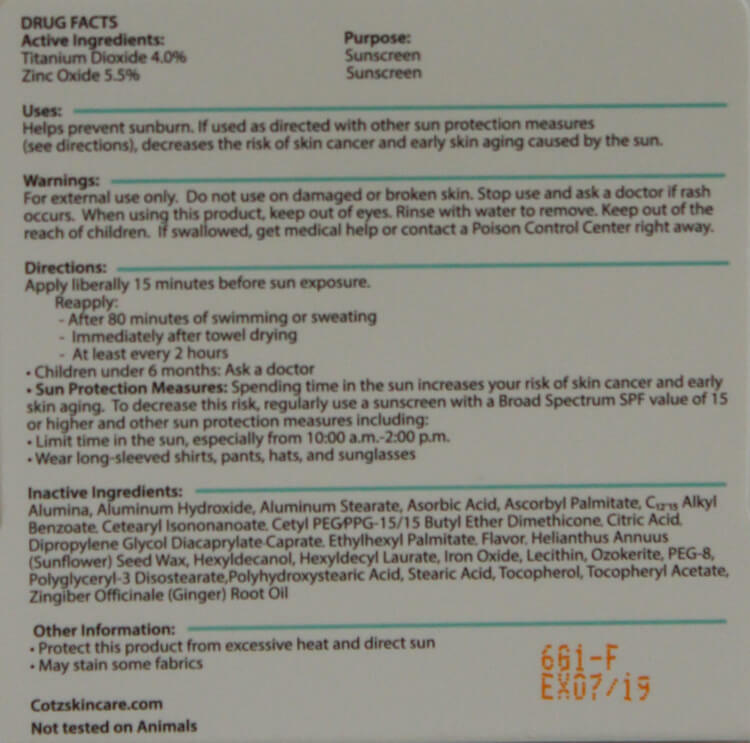 To be transparent I’m going to let you know up front that CoTZ sent me this product as part of a 4-sunscreen sample pack. I’ve written a review of each sunscreen, if you’d like to know about the others. CoTZ are a fantastic brand and company that produce amazing sunscreen products. They try to use only the safest ingredients and cater to a range of sensitivities by keeping their products free from chemicals, oils, preservatives, parabens, PABA, gluten, and phthalates. On top of this they’re both cruelty-free and vegan. CoTZ sound great. But what about their lip balm? Let’s dig into the details! Active Ingredients: Titanium Dioxide 4.0%, Zinc Oxide 5.5%. Inactive Ingredients: Alumina, Aluminum Hydroxide, Aluminum Stearate, Asorbic Acid, Ascorbyl Palmitate, C12-15 Alkyl Benzoate, Cetearyl Isononanoate, Cetyl PEG/PPG-15/15 Butyl Ether Dimethicone, Citric Acid, Dipropylene Glycol Diacaprylate-Caprate, Ethylhexyl Palmitate, Flavor, Helianthus Annuus (Sunflower) Seed Wax, Hexyldecanol, Hexyldecyl Laurate, Iron Oxide, Lecithin, Ozokerite, PEG-8, Polyglyceryl-3 Diisostearate, Polyhydroxystearic Acid, Stearic Acid, Tocopherol, Tocopheryl Acetate, Zingiber Officinale (Ginger) Root Oil. The ‘active’ ingredients are the ones involved in sun protection. They’re the sunscreens. I’ll talk more about them a little later, just know that these are the two most effective available. The ‘inactive’ ingredients are all the others that don’t help with sun protection. They help with texture, moisturizing, tint… the list goes on. That list of inactive ingredients does look a little intimidating. There’s lots of words on there that aren’t recognisable and don’t make a lot of sense. I went through and took a look at each of them and found nothing that’s concerning. They’re all common cosmetic ingredients, most of which can be derived naturally. There’s also no oils in there which is a common cause of products getting that ‘greasy’ feel to them. This lip balm sunscreen contains the two best active ingredients – zinc oxide and titanium dioxide (in that order). Together they make up 9.5% of the product. This combination provides very effective broad spectrum sun protection. You get complete protection against the full range of the UV spectrum. This includes both UVA (which alters DNA below the surface of the skin) and UVB (which is responsible for sunburn). The level of protection against sunburn (measured by SPF) is well above the recommended SPF 30 level at SPF 45. This level of protection means that 97.8% of UVB radiation is stopped from reaching your lips when the balm is applied properly. On top of all this, the sunscreen also offers 80 minutes of water resistance. This is the longest available on the market and means the lip balm stays put even when swimming. Just remember to reapply every 2 hours (80 minutes is you’re in the water) or after toweling off. 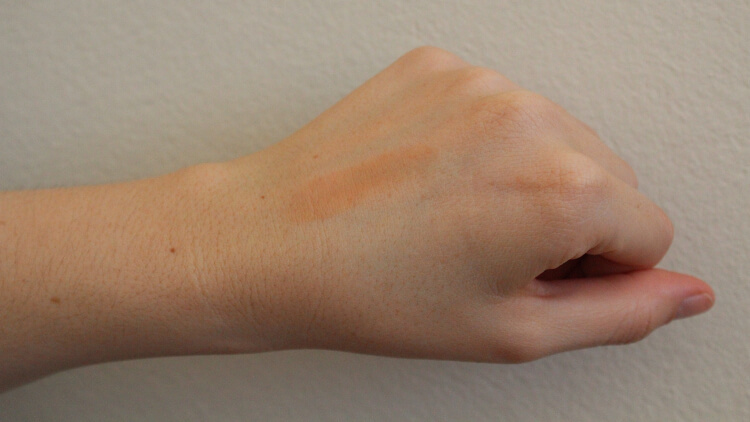 It looks really dark, but when it’s on the skin and worked in properly this fades to a level closer to a normal skin tone. 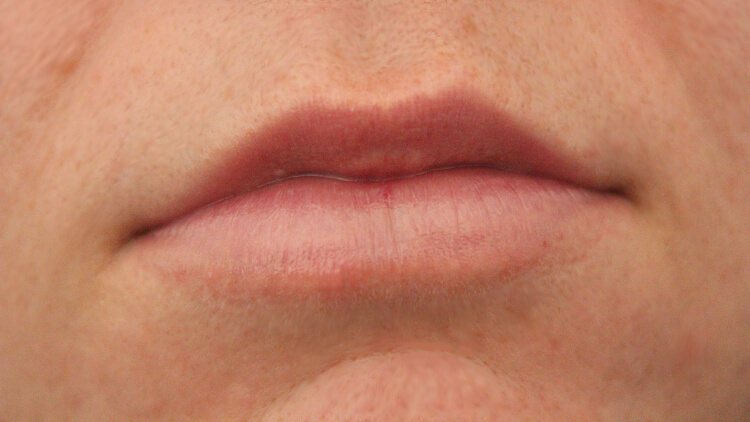 Although there is a slight difference on my lips (see photo below), it could easily pass as just my natural skin tone (but it looks slightly better with the balm). The lip balm contains no oils and doesn’t feel greasy on the lips. You can notice it’s there – obviously – but it’s not greasy. 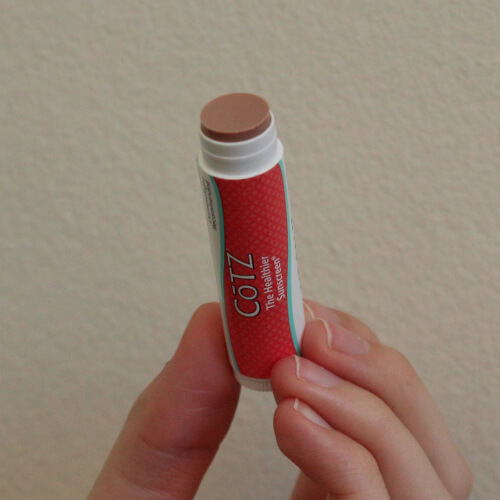 CoTZ Lip Balm blends well with your natural skin tone and doesn’t leave a noticeable shine. The lip balm has a pleasant smell that comes from the addition of ginger root. If you’re not a fan of ginger you might not like it, but it’s not overpowering so you may not even notice it when on. 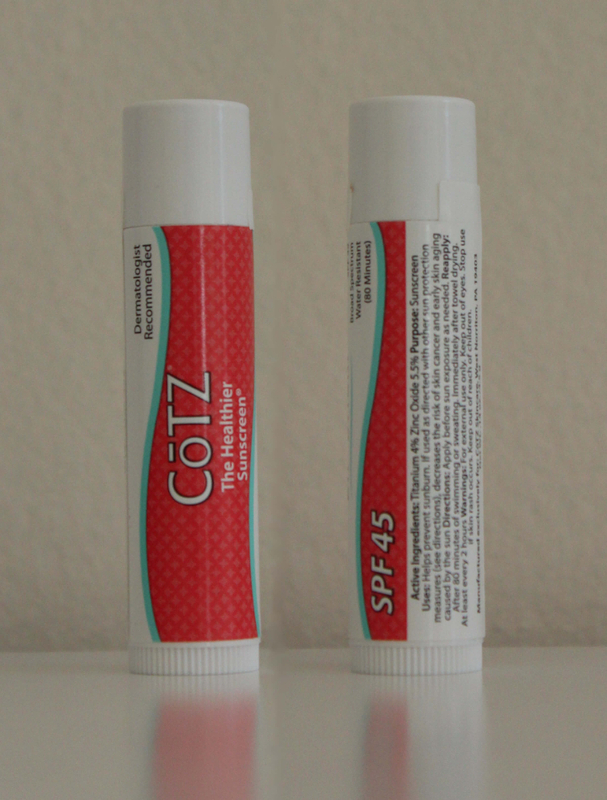 CoTZ Lip Balm comes in a standard twist lip balm tube. It’s easy to apply and rubs on smoothly making it simple to get an even distribution for effective sun protection. The balm does a great job of hydrating the lips. It contains a range of emollients and after weeks of daily use I haven’t noticed any dryness and, in fact, am enjoying its moisturizing effect. It works well in casual contexts and when you’re not interested in wearing lipstick but it’s not a genuine replacement. I’ve been using this product on a daily basis for some time now and haven’t had a single issue with pimples around my lips. However, I have to highlight two ingredients in the formula – Ethylhexyl Palmitate and Polyglyceryl-3 Diisostearate. Both of these ingredients have the lowest (and therefore safest) rating on EWG’s Skin Deep Cosmetics Database, so there’s no worry about them being hazardous, but I found them on my go to list of pore-clogging ingredients. This isn’t a huge deal as the lips have a lower number of pores compared to normal skin areas, but then there’s the skin just around the lips that this balm will come into contact with. As I said I haven’t had any problems after weeks of daily use, but I thought I’d put this in the review so you have all the info before you buy. 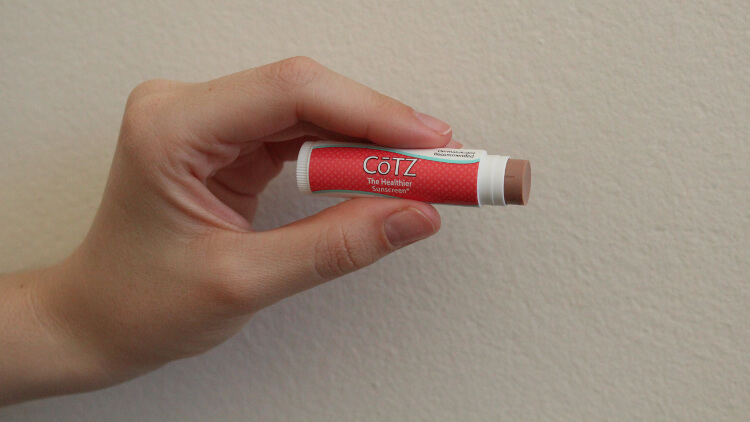 CoTZ Lip Balm’s list of amazing features – sun protection, tint, fragrance, hydration – position it at the top (and more expensive end) of its market. It’ll cost you a little bit more than you’re used to paying… but it’s worth it. I loved using this product. It was so easy to incorporate into my routine and just takes lip sun protection to a higher level. Although this one was a freebie – I’ll definitely be getting some more.